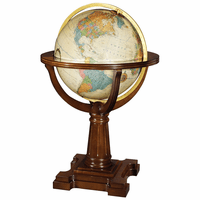 Colorful countries around the world are highlighted to perfection in the 20' diameter Trenton floor globe, by Replogles Globes. 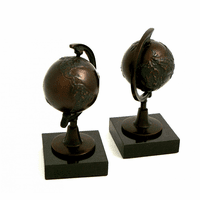 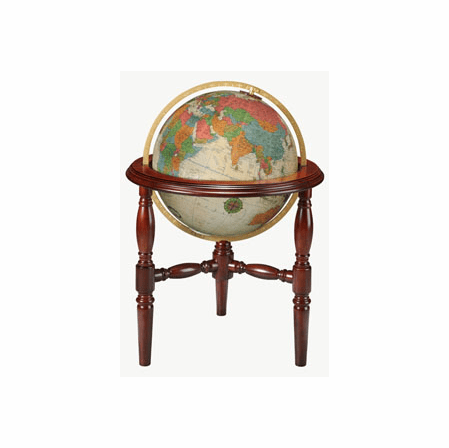 The aged parchment white oceanic background adds an antique look to the hand covered globe, and is attached at both Poles to an engraved aluminum meridian in brushed brass finish. 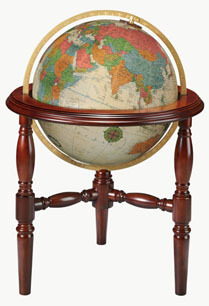 The globe is lit from within by a touch-on light control, adding elegant illumination to the details and to your room. 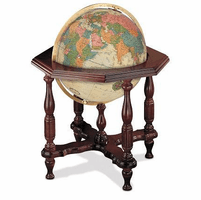 It is set in an ornately detailed solid hardwood 3-legged floor stand, with total dimensions of 27' x 27' x 37.2'.